This is an original Telefunken PLC200 Triode, Pentode combination electron tube in a ten pin - decal - all glass envelope. 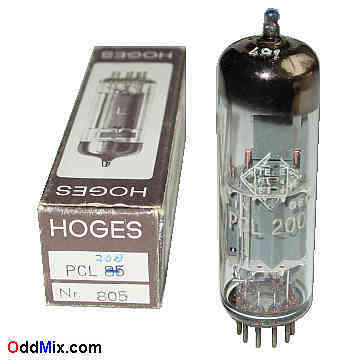 This tube - were truly a latest - addition to the vacuum tube family of devices. It was made for use as a complete video amplifier in TV [televison] sets. Because of the tube's high bandwith, it is an excellent choice to build a Hi-Fi audio amplifier. A triode-pentode combination may be used for many other special purpose circuits, oscillators and AF amplifiers. Excellent for replacent part, antique radio or television restoration, projects or to set up a private vacuum tube museum. It is a NOS tube - New Old Stock, unused, excellent condition.